In the Autumn of 1999 two friends and I spent just over two weeks on the island of Cuba, driving from Havana to, firstly, Pinar del Rio in the west and then, via Trinidad, Santa Clara and Camaguey to the second city Santiago de Cuba in the east. Leaving the car in Santiago (as planned) we returned on the overnight train to Havana from where, after another couple of days, we flew home. I also had a day on the Hershey interurban, riding to Matanzas and back. The overnight train was fun, the Santiago to Havana mainline was maintained in pretty reasonable condition, we reached and maintained 100 kph on occasions. Our train (no.14) consisted of first class chair cars (no sleepers) which featured large reclining leatherette seats which were pretty comfortable, and we were next door to the buffet car, which was a bonus. The cars themselves were relatively modern, built by Fiat-Concord (now Materfer) in Argentina, no air-conditioning but the Cuban night is warm and fragrant. The train was full, we bought tickets a couple of days before from a small allocation reserved for tourists. At Santiago's new station there are two ticket windows, one for locals and one for foreigners. Our queue, such as it was, was a haven of tranquility, the one next door was a seething mass of animated humanity, it was all quite surreal. Reservations were done manually, our names were entered into a reservation ledger. I think we paid about $30 each, probably ten times the cost for locals. On board we weren't segregated into a tourist-only car, thank goodness. There was a live band in the car next door which enlivened procedings as far as Santa Clara, as did our bottle of Havana Gold (El Ron de Cuba) for impromptu canchanchara cocktails! Leaving Santiago at 17:00, behind an MLW MX624, the journey was going well until the train went into emergency after a brake pipe failed at a small wayside station called Marti. That was fixed and we arrived in Camaguey only some 45 minutes late. 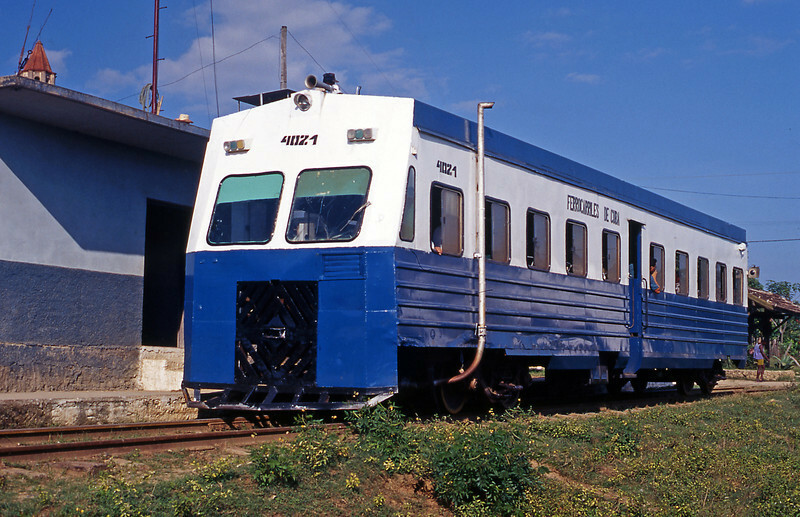 But in Camaguey a problem with the baggage car resulted in a further hour delay whilst it was swapped out, so we were about two hours late when we arrived in Havana the folowing morning. Wouldn't have missed it for the world. Cuba was just extraordinary, we enjoyed some great city life in Havana, Trinidad, Camaguey and Santiago, strange other worldly scenery in Pinar del Rio, an unbeatable music scene and exotic cocktails EVERYWHERE, a complete lack of western brands and even a brush with the crustacean police. When we were in Trinidad we visited the Valle de los Ingenios - Valley of the Sugar Mills. One of the sights to see is the Tower on the Manaca Iznaga estate. the top of which is peeping over the roof of the station building. This home built railcar is due to return to Trinidad.